When Chicago Bulls’ star player Derrick Rose injured his right knee a couple days ago, I grimaced. But then I saw that it was a meniscus tear, and I thought, no big deal. He’ll be back on the court in a month. Until ESPN dropped this bombshell: Rose is done for the year, again. Now anyone who knows me knows I bring a lot of baggage to knee injuries, surgeries, and rehabs. So let’s just get that history out of the way. When I was a young high-school basketball player, I tore my left ACL, while also partially tearing my MCL, my LCL, and the meniscus on the lateral side of my knee. 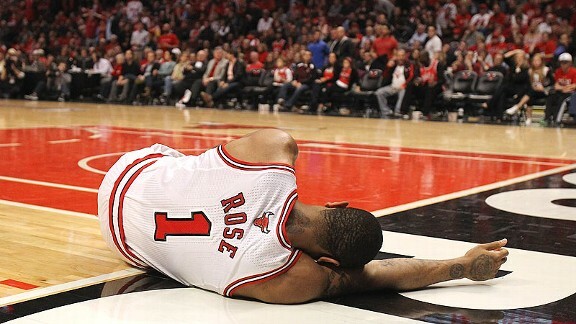 The ACL tear is the injury Rose suffered two seasons ago in the playoffs against the Philadelphia 76ers. I had the surgery about a month after my injury and played a baseball season three months after the injury. Then, I played American football in the fall, and a half of a basketball season before tearing more of my meniscus. So I had another surgery and was playing again in a month. Then, I played a season of baseball, a season of soccer, and a season of basketball before injuring the meniscus again in the same knee. Another surgery, played again in a month. Then three straight injury-free seasons of soccer, basketball, and baseball. Then, I played college baseball for about a year-and-a-half before injuring the meniscus again, having a final surgery, and calling it quits on my athletic career. 1. Is Rose simply content earning a high salary without producing all that much on the floor? He chose to sit out longer than necessary last year, and he’s doing it again this year. Can you imagine, for example, Michael Jordan making those same decisions? I think we all know the answer to that question. Rose’s youth cannot be used as an excuse forever. It’s not like he’s going to play into his mid-forties because he sat out two years during his twenties. Our bodies limit us even when we’re careful. 2. Are the Bulls hiding something about the injury? Is there something about it that is more serious than is being advertised? 3. Is this simply a symptom of this generation of athletes? Generation Coddle, we might call them? Maybe it’s not even Rose’s fault, really. There are probably all kinds of people feeding ideas into his head about what he should be doing in situations like these. Dare we mention Stephen Strasburg here, the star pitcher that the Washington Nationals held out of the 2012 playoffs, not so much because he was injured but because he had passed some arbitrary pitch count? 4. Is Rose injury-prone? Does such a thing even exist? Are some athletes, Greg Oden and Rose included, just a bit more brittle than others? Is this latest injury simply the second of many more that we’ll have to painfully witness throughout this gifted player’s career? I fully admit, these questions are all speculative. I have no inside sources here. But I do think they’re valid considerations. I suppose the rest of Rose’s career will provide the answers, one way or another.